The fraud case involving a Malaysian tech company which allegedly cheated British investors of RM13.3 million will be heard at the Petaling Jaya sessions court on Monday. 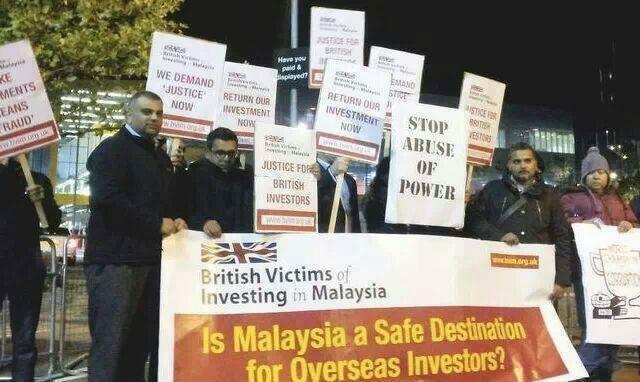 But the victims, known as the British Victims of Investing in Malaysia (BVIM), in a statement said they were surprised only one of Doxport Technologies Sdn Bhd’s three directors was facing trial. Managing director T. Sivalingam will be tried on charges of criminal breach of trust. The other two directors not charged are former Umno treasurer Datuk Seri Abdul Azim Mohd Zabidi and Gurmeet Kaur. The group also said their civil suit alleging fraud and conspiracy by Doxport and directors Azim, Sivalingam and Kaur will be heard at the Kuala Lumpur high court from January 19 to 22. BVIM said British parliament's Lord Ahmed of Rotherham, who corresponded with Azim, will be a witness in the suit. Doxport grabbed headlines last year after BVIM staged a protest in London at the venue where Prime Minister Datuk Seri Najib Razak was attending a business conference. The group said the Malaysian authorities had not taken any action against Doxport which allegedly cheated them in 2008. Its members said they invested in purchasing Telekom switches and equity in Doxport only to realise later that Telekom did not use such switches in Malaysia. The disgruntled investors lodged a report at the federal police headquarters in Bukit Aman, the Malaysian Communications and Multimedia Commission and the Companies Commission of Malaysia in 2011. Early last year, the group filed the civil suit against Azim and the company. The investors in their statement of claim want the defendants to pay back among others, the amount which was paid to Sivalingam, and the statutory interest and costs deemed fit by the court. – December 19, 2014.